The next for extra channels are not as important as the first. In some way they are more like 12 Main Channel, although they are not connected with any internal organs. These for extra channels go from the legs up to the head and so in some way or similar to the Chong Mai 衝脈 as they connect the whole body together from the legs to the head. 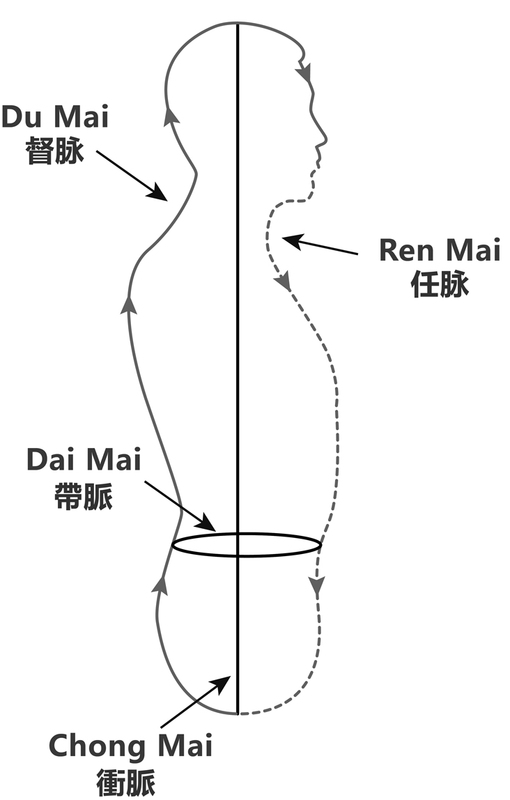 The Chong Mai however, starts from the Dantian 丹田 going up to the head and down to the feet so we can see that if the Chong Mai is clear and smooth then the second four Mai are more easily clear and smooth. 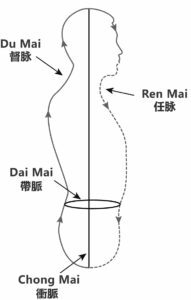 The first four Mai; Ren Mai 任脈, Du Mai 督脈, DaiMai 帶脈 and Chong Mai 衝脈 the major motorways or highways and the second four Mai are like the secondary big roads like A Roads in the UK. All Eight Extra Mai are wider can allow Qi flows fast like the traffic on motorways or highways which can be more lanes, in China some highways have 14 lanes, so more traffic can flow. This is the same as your Qi and so more energy can flow in the mai and channels (Jinglou 經絡). This increased flow of Qi that is the reason a Qigong practitioner’s mai and Jinglou are more straighter and the some of the acupuncture points are in slightly different locations than ordinary people.